This corner unit of the conservatory has been set aside for the cultivation of plants from the Namib Desert but with the emphasis on Welwitschia mirabilis, flagship species of the Namib and also Namibia’s national plant. The adult plant consists of a woody, very fibrous, hollowed out cone-shaped (obconical) stem up to 1 m high, and two long, broad, leathery, strap-shaped leaves which often become divided and tattered with as the plant ages, due to the fragmented growth of the stem base. Growth of this stem is very slow, only about 1-3 mm per annum. Welwitschia plants cannot be transplanted and all the plants in this unit were established by seed which originates mostly from the northern Namib in southwestern Angola. Seeds were also obtained from Namibia as well as from plants grown in the nursery collection. The reddish sandy soil was introduced from the arid Knersvlakte in the Western Cape. Welwitschia seeds were sown 11 November 2009 and treated with fungal inoculants to prevent fungal disease at the seedling stage. They germinated within 1 to 3 weeks. The young seedlings, initially only have a pair of cotyledons (seed leaves). These temporary leaves are reddish, due to anthocyanin pigments which protect the young plant from excessive and harmful sun radiation. The cotyledons soon turn green and are followed by a second pair of leaves which are the permanent set of leaves which the plant will carry for the rest of its life. The cotyledons eventually wither in a year or two, while the true leaves grow longer and broader. 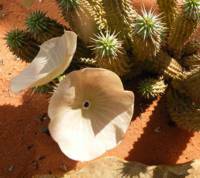 What makes Welwitschia so special? Three amazing phenomena make Welwitschia very special in the plant world and the reason so many people visit the Namib Desert to see the plants in their native habitat. The first is its apical growth point. Most plants have a bud at the tip of the main stem, which grows throughout its lifetime, but in welwitschias, this bud stops growing from an early age. The second is its leaves. It has just two leaves throughout its lifetime, they are never shed and grow, like conveyer belts, about 15 cm longer every year. The third is that this plant is cone bearing (like pines and cycads), with male and female plants separate. The male cones are smaller and appear about 3 years after germination (in cultivation) and after about five years female cones start to appear. The cones produce nectar and are pollinated by flies and wasps. After pollination the seeds take about a year to develop. The female cone falls apart when ripe releasing the winged seeds which are dispersed by the wind. Other plants from the Namib which have also been introduced include the bushman’s candle (Sarcocaulon mossamedense) (left), sesame bush (Sesamothamnus benguellensis), Kaoko aloe (Aloe kaokoensis) and the Namib mother-in-law’s tongue (Sansevieria pfeisteri). Very prominent in the Namib are the various cork-bark species. These are shrubs or small trees. Plants grown here include Commiphora virgata, narrow-leaved cork-bark (C. angustefoliolata), oak-leaved cork bark (Commiphora wildii), Mossamedes corkbark (C. mossamedense) and C. steynii. The bitter ghaap or hoodia (Hoodia gordonii) is a cactus-like plant which belongs to the Oleander Family (Apocynaceae). 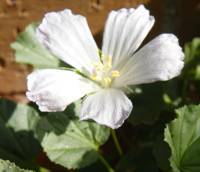 It has spiky stems and large foul smelling dish-like flowers during summer which are pollinated by flies. Hoodia currorii and H. mossamedense are also grown here. There are several members of this family which have also been planted in this bed such as the dwarf carion flower (Stapelia parviflora) from the northern Namib. It has the smallest of all stapeliad flowers. Lavrania haagnerae grows on limestone cliffs. It has clusters of succulent stems. Cyphostemma macropus and C. uter are both Namib plants with thickset succulent branches bearing pinky peeling bark. They belong to the grape family (Vitaceae). 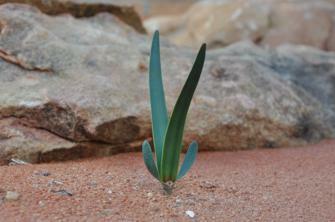 The Namib petalidium (Petalidium glandulosum) and silver petalidium (P. latifolium) are fast growing Namib shrublets. The curly-leaved petalidium (P. glandulosum) is an aromatic shrub. It has curly leaves with sticky glandular hairs and conspicuous red flowers pollinated by sunbirds. Aloe dewinteri and Aloe corallina grows on cliffs in the northern Namib, both bearing coral pink flowers.